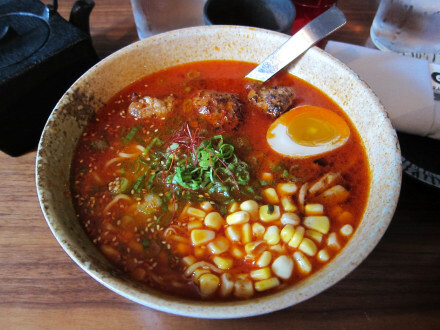 I became a fan of ramen when I heard from readers about the excellent ramen restaurants that I should try when I was in Seattle. This was great news when I found out about the flavor treat that this offered, but it may be even better news that this type of food is now spreading throughout the United States. Unlike other ethnic cuisines, ramen does not seem to be spreading through the migration of Japanese people to cities such as Oklahoma City. Rather, it is a dish that is becoming so popular that anyone who can do a decent job preparing it seems to have all the business they can handle. I do not know the story about Goro or whether the owners have ties to Japan, but I would definitely say they do a good job with the ramen. There are four types of ramen on the menu, including a chilled one. I did not encounter spicy ramen in Seattle, but this is one of the choices here. A few other menu choices are offered, but I believe the expectation is that most people will order ramen. Like the other ramen, Spicy Miso comes in a large serving that really takes a good appetite in order to finish (I found the ramen in Seattle to be about three-fourth the size of the one here). The broth of this soup seemed to have a straightforward explanation–it is miso mixed with red chiles. The result was a spicy and flavorful soup, although it was not as spicy as the typical Korean (kimchee) or Thai red chile dishes I have tried. A very good broth was enhanced by a number of other ingredients (many of which can be seen in the photo). I would make special note of the meatballs, which were quite flavorful. There were only four types of ramen served, and somehow the cold one did not seem very appealing (although it may surprise me the same way the miso ramen did). The restaurant appears to do only one thing, and that is ramen. I think they do it well, though. I went at a very off time (about 3:00 pm), and even at this time it was very busy. I have heard that tables are hard to get during lunch hour, but in my own experience there was not any problem. A pot of green tea was six dollars (half the price of the miso), and I only ordered it because I was sharing with a friend. The flavor of the tea, though, was far beyond the normal version found in Japanese restaurants, and it was definitely an enjoyable experience. 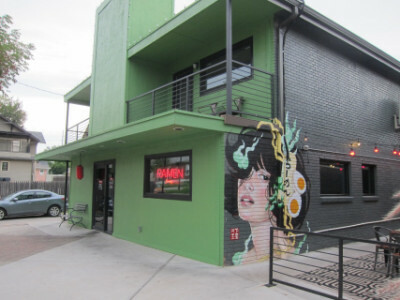 The Plaza District, in which Goro is located, has become one of the hottest restaurant rows in Oklahoma City, with many cuisines being offered. Goro strikes me as not just a trendy restaurant but actually a very good one (I do not understand, though, why more versions of ramen are not offered). Yelp says Goro has a full bar, so this may be a place people like to come for a while and relax. At lunch, though, it seemed to be a place where most people were in and out fairly quickly. The Plaza District has free parking on the street, and probably in most cases it would be within a short walking distance of the restaurant. Be aware when looking for Goro, though, that it faces N.W. 16th Street rather than Blackwelder. This entry was posted in Oklahoma City, OK by Steve. Bookmark the permalink.